A pair of scientist parents. A doomed world. A baby sent away in the hopes that he would live, and thrive, on another world. If you think you’ve seen it before, you’re wrong: This is not Superman; these are the adventures of Ulysses, the Last Son of Earth! 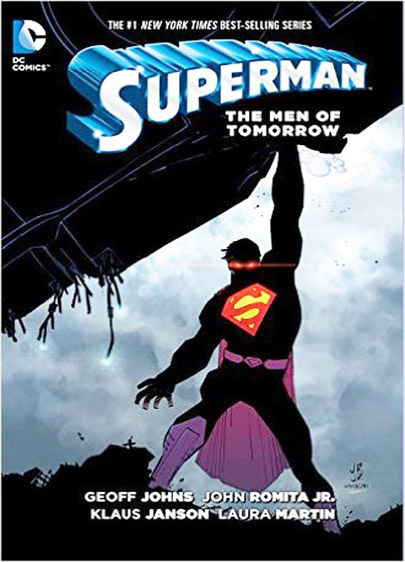 Comics legend Geoff Johns (Green Lantern: Rebirth; Infinite Crisis; Blackest Night) and art royalty John Romita Jr. (Iron Man; Uncanny X-Men; Daredevil; Amazing Spider-Man) spin a thoughtful tale of Superman’s encounter with a twisted take on his own legend. Johns’ genius, however, is that he’s not “just” a writer of superheroes. He writes character dramas, stories that involve all aspects of the character. In the story, we see Superman’s fears, doubts and sense of loss laid bare; he rejoices at the reunion of Ulysses and his parents, but we see his realization that his own birth parents remain lost to him, as do his adoptive parents. Even as Johns explores Superman’s pain, he deftly seizes the opportunity to explore Clark Kent’s own personal and professional struggles as he ponders whether to return to The Daily Planet newspaper. Clark’s tale, and that of his heroic alter-ego, come together organically as Johns weaves his plots into a single narrative. Don’t worry, though: The emotional threads move throughout the book, but there is plenty of action and property damage, and Romita is as adept at making it all believable as he is at making you feel the emotions his conspirator’s writings evoke. Oh, by the way? Superman develops a new superpower, a natural outgrowth of his abilities. Hmmmm. In retrospect, I probably should have mentioned that earlier, right?